Freedom To Save: Sprint Black Friday 2012 Ad LEAKED! 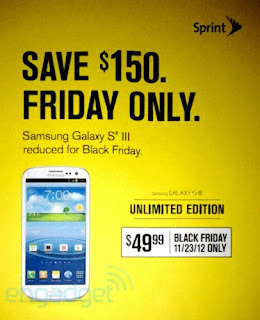 Sprint Black Friday 2012 Ad LEAKED! Well Black Friday is coming soon and as you may know Black Friday has shifted gears from being all about the best deals on computers big televisions, to deals on the best smart phone. Early yesterday morning, the Black Friday Ad was leaked. According to the ad the Samsung Galaxy S III will be selling for an amazing $49.99 which is a huge drop from its regular price - $199.99. So if you are eligeble for an upgrade anytime around Black Friday, or better yet on Black Friday I suggest you wait and upgrade for this amazing Samsung Galaxy. That way you save some money and you have a lot of time to shop after you upgrade your new phone.